On 11 June 1776 John Constable was the fourth of six children born to parents Golding Constable and Ann Watts Constable. He arrived into a family that was both hardworking and prosperous. Named by his childless Uncle Abram as his heir, Golding Constable inherited richly in 1764, acquiring money, stocks and property. The land included a watermill on the River Stour in Flatford on the Suffolk/Essex border. This wealth was joined by the ample dowry brought to the marriage by Ann. As the business flourished, Golding and Ann’s family grew. They moved close by, to East Bergholt, in 1774 where Golding set about building a vastly impressive home for them. It was here that John Constable would spend his childhood, which he would later describe affectionately as his ‘careless boyhood’. When baby John arrived on that summer evening in 1776 he was so weak it was feared he would not survive for long. The reverend was hastily summoned, late the same night, to perform a baptism, lest the infant should die unchristian. Despite this rather inauspicious beginning John quickly developed into a robust and healthy child and remained so. The Constable family had a strong sense of their position in life and also within their community. Everybody knew everybody else and, socially, they all knew ‘their place’ from those who worked the land to the gentry. John Constable knew exactly where life had placed him. He and his family anticipated his entering the business at the earliest convenience. The learning difficulties and possible epilepsy of John’s elder brother Golding left John as the natural male heir. As John Constable grew up in this world he developed a belief in rural life; that the land would always provide. In his mid-teens he took up work in the office and two mills owned by his father. It wasn’t long before John learnt something of the art of ‘reading’ nature. By studying cloud formation and movement, plus the light cast by the day, he discovered that the mill workers could correctly anticipate oncoming weather. The sails would then be adjusted accordingly. Subconsciously, young John Constable was already learning how to capture the perfect landscape painting. No landscape is complete without clouds and for true harmony upon the canvas, clouds and the light they cast need to be understood. Their grain and milling business certainly prevented the Constable family from feeling the harsh side of eighteenth-century poverty but they were not free from occasional lean times. The children all learnt the necessity for thrift. The family bore no illusion that they were part of the gentry but they were well connected within the community. John’s mother Ann was acquainted with Lady Beaumont who resided in some elegance in Dedham. At eighteen John Constable became the friend and painting companion of John Dunthorne. Six years his senior, Dunthorne lived close to the Constable home with his wife Hannah. Although primarily a plumber and a glazier, he earned a living using a whole range of skills that could fall under the title of handyman. He even took on the role of village constable for a while. However, it was Dunthorne’s love of painting that led to the inseparable friendship with Constable. Off they would wander with easels and paint-boxes to capture the scenery each day. They would only paint for a particular segment of the day – when the light and shadows moved, the pair would not continue until the very same time on the following day. Despite the lack of any formal artistic training, Dunthorne proved himself an excellent teacher to John. They worked together on ideas concerning composition, light and colour and Constable acquired the skills to not only get the best from his brush work but also how to care for the equipment and materials. John’s mother Ann did not wholly approve of her son’s friendship with Dunthorne. Not only did their pastime frequently distract John from the family business but also, Dunthorne was of a considerably lower social class than her son; a matter of crucial importance in Georgian England. She interfered in a shrewd fashion. She did not attempt to inhibit the friends, simply introduced a new influence. John was clearly never to be dissuaded from his artistic pursuit. Ann formulated a socially acceptable plan around John’s obsession. In 1795 she arranged for John to call on her wealthy connection, the now twice widowed, Lady Beaumont in Dedham. The call was planned to take place whilst the son of Lady Beaumont, Sir George, visited his mother. Sir George Beaumont was an incredibly wealthy baronet, boasting many properties. He had done the Grand Tour, learnt art at Eton and was now both amateur artist and a collector of exemplary taste. After viewing some of John’s sketches and the copies he had made of great works, Sir George encouraged him to study art. He also showed John many of his personal acquisitions, particularly some watercolours by Thomas Girtin, a new artist breaking through in London. Crucially he showed John a work that would inspire him for his whole life. 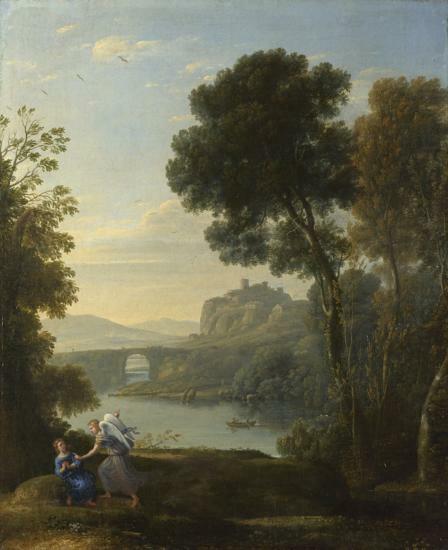 It was a scene by Claude Lorrain from 1646. Sir George loved it, Constable was stunned. The painting, which now hangs in the National Gallery, was entitled, Hagar and the Angel. It depicts an annunciation. In Genesis sixteen, the story is told of a servant girl called Hagar who became pregnant by Abraham. After arguing with Sarah, the childless wife of Abraham, she fled. An angel found her in the wilderness and informed her that her unborn son was destined to found a great tribe and, for now, she must return to Sarah. Later in life Constable would produce his own copies of this work. John continued to work for his father. Whilst attending to family business in Edmonton in 1796 he was fortunate enough to become acquainted with two, already professional, artists during a stay with his Aunt and Uncle. They were John T. Smith and John Cranch. Smith advised John to familiarise himself with both Count Algarotti’s Essay on Painting and Leonardo’s Treatise. Smith also had John assist him on a professional basis, during his stay in London. Cranch also added to John’s reading list with texts by Hogarth, Reynolds and de Piles. Once returned to East Bergholt, John devoured the recommended reading material and continued to paint with Dunthorne. Smith and Constable continued to correspond and Constable assisted him in putting together a subscription publication entitled, Remarks on Rural Scenery, which John enjoyed and promoted with considerable efficacy. John had hoped Smith may help his cause with his family and although initially he seemed to resist and considered more favourably the plight of his parents, Smith finally pushed forward with some assistance to John, to realise his ambitions. Welcombe back! Hope the problems you had are over or better now. Nobody could paint nature like the Romantic artists :).